Who nose? Henry Goodman, left, and Freddie Fox star in Edmond de Rostand. There’s definitely a story of comedic genius to be told about the real-life creation of Edmond Rostand’s greatest play, Cyrano de Bergerac. Alexis Michalik’s French hit, rather ponderously translated by Jeremy Sams, isn’t quite it. The production, staged in English for the first time at Birmingham Rep, reveals how the little-known Parisian poet and playwright Rostand came up with his brilliant creation in double-quick time at the tail end of 1897 as events in his personal life triggered ideas for the plot of his newly-commissioned play. How much is true and how much the pure invention of Michalik is unclear: what’s important is that the conceit drives the entire plot throughout the long two-and-three-quarter-hour show. If you know your Cyrano, all well and good. But Michalik and Sams don’t want to risk it, so they labour the point by including great chunks of expository information (as well as chunks of the actual Rostand play) to make sure we’re up to speed. There are also various subplots about the lead actor, Coquelin, owing money to his investors, those investors having a lucrative sideline in bordellos and Coquelin’s son being an incompetent actor who just needs a good deflowering to help him relax. Throw in cameo appearances from Sarah Bernhardt, Georges Feydeau, Maurice Ravel, Anton Chekhov et al, and you’ve got the recipe for lots of frenetic action. What really redeems Roxana Silbert’s production is its stunning appearance. Gorgeously designed by Robert Innes Hopkins, the set is versatile enough to give us a sumptuous fin-de-siecle Paris reminiscent of the film Moulin Rouge, an ingenious hotel balcony scene worthy of a Feydeau farce and even the stage and auditorium of the theatre where Cyrano made its debut. It’s a feast for the eyes and a beautiful backdrop for the breathless endeavours of the 14-strong cast. Among the performances, Freddie Fox manfully holds things together as the increasingly desperate Rostand, torn between matrimonial love and his inspirational but platonic muse. Henry Goodman relishes his over-the-top turn as the actor Coquelin, while the supremely talented Josie Lawrence is sorely underused in a series of bit parts. Much of the comedy tries rather too hard to be funny, from the double act of the impresarios to the star-struck hotel concierge channelling John Cleese’s French taunter from Monty Python and the Holy Grail. There are some decent lines and some entertaining business but it’s too long and too clunky – much of it in stilted rhyming couplets – to punch home with its intended farcical force. One wonders if, in its journey across the Channel, the humour has been lost in translation. Courtroom drama: From left, Misha Butler as Ronnie, Aden Gillett as Arthur Winslow and Timothy Watson as Sir Robert Morton. Terence Rattigan’s classic courtroom drama about the innocence or otherwise of young naval cadet Ronnie Winslow earns its dramatic power from one brilliant idea: it never leaves the drawing room of the family’s home. Rattigan’s coup is that he brings all the excitement, cut-and-thrust and tension of the court into the heart of the Winslow home and doubles its impact by making it strikingly real in their personal lives. As with the court case itself, the question of whether the teenage Ronnie actually stole a fellow cadet’s five-shilling postal order becomes increasingly unimportant to the proceedings. The facts may matter hugely to Ronnie’s father, fighting to prove the boy’s innocence, but in the end they’re secondary to the much bigger themes and urgent ideas that emerge as the narrative unfolds. Written just after the Second World War, The Winslow Boy explores a host of pertinent notions that retain a remarkable resonance today: whether diametrically opposed political viewpoints can work together for a common aim; how to achieve gender equality in an unequal world; and when does the greater good override individual rights and ambitions. Director Rachel Kavanaugh embraces these questions and puts them, quite rightly, centre stage. Thus, when Arthur Winslow’s righteous battle for his son’s good name threatens every member of his family in one way or another, we are confronted with his dilemma of personal accountability for a bigger principle. With the help of Rattigan’s beautifully constructed script, the ensemble develop and explore these themes with forensic precision. Kavanaugh has clearly worked hard on meticulous timing, from specific lines to entire scenes, and the result is an impeccable, perfectly judged whole. The occasional line may get garbled in the pursuit of a wider point, but the overall drive and intent are clear and superbly delivered. Staged handsomely by designer Michael Taylor, and lit with judicious care by Tim Lutkin, the production looks terrific and features performances to match. Aden Gillett and Tessa Peake-Jones work wonderfully together as the parents of the accused boy, wrangling with their consciences, their finances and their marital relationship with just the right mixture of tension and mutual admiration. Gillett in particular offers a linchpin performance around which the rest of his family and the intervening characters revolve. Timothy Watson provides a totally believable blend of impenetrability and legal uprightness about the barrister who takes on the case, Sir Robert Morton, allowing hints of emotion and humanity to creep in as the action develops. Opposite him, Dorothea Myer-Bennett is feisty and vulnerable as Ronnie’s older suffragette sister with her own battles to fight. Amazing, after more than 70 years and despite being set over a century ago, the play feels fresh and timely. In the hands of this talented company and director, it still packs a punch and has stacks of important things to say to a 21st century Britain divided by issues so much bigger than a five-shilling postal order. Impressive: Kenneth Cranham and Amanda Drew in The Father. Playwright Christopher Hampton has made something of a speciality out of translating modern French plays for British audiences. The latest to come to his attention is The Father, a study in dementia by the French writer Florian Zeller. 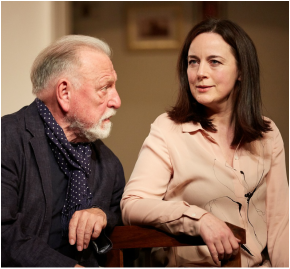 The play comes to Birmingham fresh from an extraordinarily successful London run, where it garlanded a virtually unprecedented 10 five-star reviews from the national press amid universal admiration for Kenneth Cranham in the title role. It’s easy to see why Cranham’s performance was so lauded. He’s immensely credible as the dotty dad not quite sure how he finds himself entering his dotage. Cranham ranges from acerbic adult to little-boy-lost, sometimes in a moment, and his mystification at the collapse of his mental world is almost palpable. Amanda Drew is equally impressive as his daughter, struggling with the rights and wrongs of putting him in a home. Her internal wrangling is as poignant as his external descent into madness, and theirs is the pivotal relationship. As a production, The Father fares less well. Miriam Buether’s elegant Parisian apartment design looks superb, and there’s some clever theatrical trickery that contributes to the sense of unsettling bewilderment which the audience is encouraged – or rather, forced – to share with the eponymous dad. But director James Macdonald does labour the point somewhat, particularly in the increasingly irritating use of disjointed, needle-stuck music covering the many scene changes, and he’s not aided by Hampton’s stilted, stuttering speech patterns. Yes, we get that dementia can be disconcerting for all involved. After an unbroken hour and a half of having the message reinforced, it comes perilously close to repetitive. The Father is an interesting exercise which ultimately has the feel of being exactly that: a writer flexing his writerly muscles with form and content to see how much he can get away with. Fortunately for Zeller (and Hampton), he’s saved by some gripping performances and a few dramatic illusions. Supremely seedy: Nicholas Farrell as Guy Burgess in Single Spies. Picture by Alastair Muir. ALAN Bennett claimed not to have been interested in the spying side of things when he wrote his two companion-piece one-acters An Englishman Abroad and A Question of Attribution. Instead, he argued that they were about exile as much as espionage, and it was this that really fascinated him. Whatever the inspiration for the plays, their pairing in one evening and the use of central characters who were notorious as part of the post-war Cambridge spy ring makes them look very much like the writer’s ruminations on the spying game. And why not? Bennett’s ruminations on pretty much anything are always entertaining, and while his voice emerges clearer than any of his characters’ in both these examples, there’s plenty of gentle Yorkshire fun to be had from imagining a meeting between a threadbare Guy Burgess and the actress Coral Browne in Moscow, or between royal art historian Anthony Blunt and Her Majesty. In both instances, what’s going on beneath the surface is always more intriguing than the superficial conversation. For Burgess, his treachery is waved off casually as the greatest forfeit he faces in exile is to miss his old London social circle. With Blunt, the Queen (knowing, as she did in real life, that he was a traitor but perpetuating a charade for security purposes) has much to say about forgery and falsehood, but is rarely talking about the paintings in her collection. 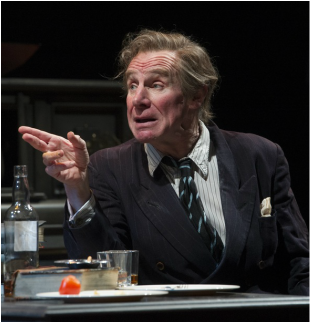 Nicholas Farrell is supremely seedy and disreputable as the fallen-from-grace Burgess in the first half of the evening. His dishevelled look and edge of needy desperation are pitch-perfect, and you never know whether to pity him or punch him on the nose. After the break, David Robb’s Burgess is meticulous and masterful, a study in deception and self-importance that reeks of research and verisimilitude. Belinda Lang straddles both halves, as Coral Browne and Her Majesty, and covers both roles equally well without quite bringing either fully to life. It’s an impossible challenge that Bennett has set, of course, because she’s usually required to serve as the foil for her male counterparts – a thankless task at the best of times. Director Rachel Kavanaugh returns to the Rep with a sumptuous production, designed by Peter McKintosh, that evokes rundown Moscow as effortlessly as the corridors of Buckingham Palace, and it’s all beautifully drilled and performed in this elegant co-production with Chichester Festival Theatre. With all the trademarks of Bennett’s wit and craft, Single Spies look set for a hugely successful run as it heads out on tour. WITH the recent death of David Bowie, this revival of the stage version of The Snowman carries an added poignancy. Bowie, of course, appeared in the original Channel 4 version in 1982 as the grown-up boy recalling his animated childhood in the Raymond Briggs fairytale that’s become a modern classic. The stage adaptation itself has become an institution, with Birmingham Rep’s 1993 production enjoying more than 20 years of reappearances. And the good news is that Bill Alexander’s accomplished interpretation is as fresh and crisp as newly fallen snow. Much of the credit for the captivating performance is down to the wonderfully elegant score by Howard Blake. Using all the colours and textures that the skillful live band has to offer, Blake’s music – built around the iconic Walking in the Air – is endlessly entertaining, picking out themes and musical jokes with panache and joy. You can almost imagine the composer smiling contentedly to himself as another impeccably evocative tune rolls off the stave. There’s magic in the dancing, too, with Robert North’s choreography making the most of every opportunity afforded by the music. The North Pole scene in particular relishes its international character stereotypes, although two cheeky penguins constantly threaten to steal the scene. And the flying sequence, when it finally comes, is simply enchanting. Ruari Murchison’s designs and Tim Mitchell’s lighting do much to add to the simple appeal of the show, and audience members of all ages respond delightedly to the spectacle. Even a technical hitch on press night, delaying the finale by ten minutes or so, could not dim the evident excitement. Like all the best fairytales, The Snowman is a story that refuses to age, no matter how old it gets. The Rep can continue to be proud of its grand old lady.